Disclaimer: I received a complimentary copy of this book from Diamond Book Distributors via Netgalley in exchange for an honest review. The small mining town of Copperhead, isolated on a backwater planet on the edge of the solar system, is in need of a new sheriff. Single mother, Clara Bronson, believes she is the right woman for the job. She and her young son, Zeke don't even get a chance to settle in before she has to deal with local squabbles, the disrespect of her deputy, a murder that needs to be solved and Zeke putting himself in danger to help a new friend look for her lost dog. 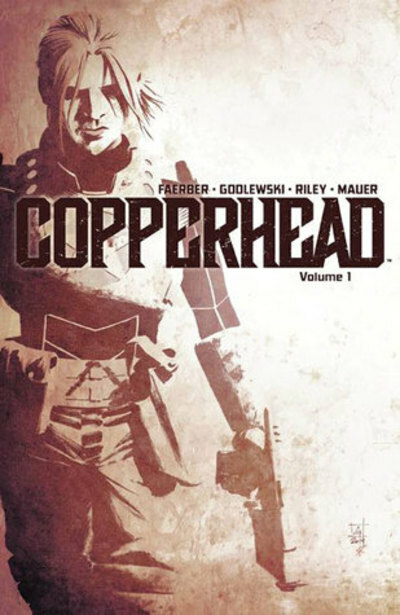 Volume 1 of Copperhead compiles the first five issues of the comic, though it was split into two parts on Netgalley and I only have the first one. So far it seems to be shaping up to be quite an intriguing story. I have no clue so far who or what the killer might be. Copperhead is vaguely reminiscent of Joss Whedon's Firefly in that it is a Western in space, but unlike Firefly, this universe has many non human intelligent species, including the insectoid "natives" of the planet Jasper, the Sewell family who are four armed cyclops people and Deputy Budroxfinicus, who looks like an anthropomorphic capybara. There are also artificial humans, or "arties" leftover from a past war. Bronson distrusts them but the courts have declared that they have rights and those on Jasper want to work for a living like everybody else. The art has a watercolour look to it, with a limited palette of oranges, browns, reds and blues. The sheriff's flying car is very Bladerunner. Copperhead is an interesting new series with a solid storyline and good art. Recommended for fans of sci fi Westerns. Should corporal punishment be reintroduced in schools?